The Legacy of Henry Corbin: "This Vast Earth: Ibn 'Arabi's Ecology of Consciousness"
"This Vast Earth: Ibn 'Arabi's Ecology of Consciousness"
Ibn 'Arabi's Ecology of Consciousness"
As one of history’s greatest universal mystics and interpreters of the human condition, Ibn ’Arabi’s teachings offer a window into a form of Islam that the West is rarely exposed to, as well as a more sophisticated understanding of the more exalted aspects of the Islamic cultural heritage. 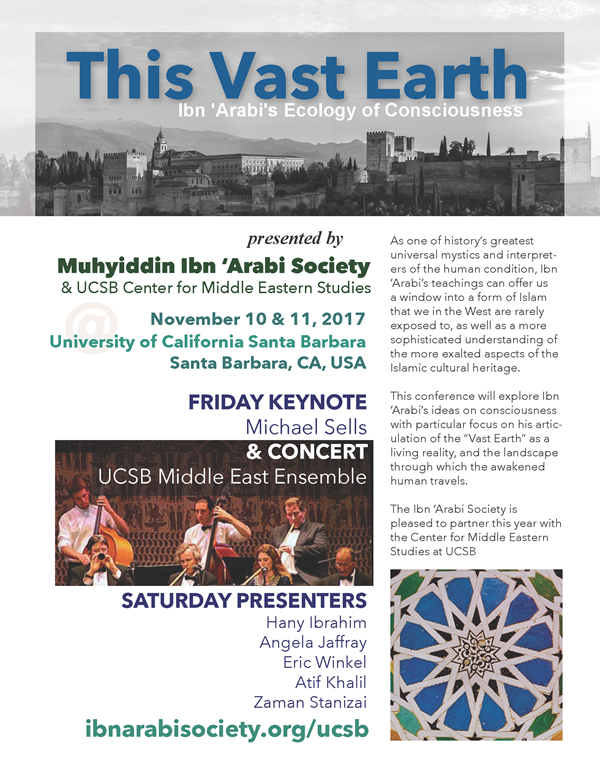 This conference will explore Ibn 'Arabi's ideas on consciousness with particular focus on his articulation of the "Vast Earth" as a living reality, and the landscape through which the awakened human travels. Don't miss this special evening of spoken word and music. Register for the Friday Night Concert and Keynote, or for the Full Conference which includes Friday and Saturdayevents.